Keeping your health care bills organized is crucial to keeping your stress levels low when you need help with medical bills and you're dealing with your health insurance carrier. Being organized will also help you get the most benefit out of your health insurance when you need it the most. Here's a step-by-step format to keep this paperwork nightmare under control so you can get help with medical bills. It's best to pay your provider after your insurance carrier has paid especially if there's a contracted rate with your insurance. Keep all your medical bill information in a file(s) in chronological order by service date (oldest on the bottom, newest on the top). Review the explanation of benefits (EOB) carefully and note what was paid, denied, or needs additional information. There will be reason codes to indicate why a charge was denied or what information is needed to pay the claim. If the claim was denied incorrectly, or if additional information is needed, take action immediately. If the claim was paid and there's no further action on your part, file it away and close it out. When you receive the bill from the provider, match it to the EOB's, verify your portion due, staple them together, and pay the bill. If you've already paid the bill, be sure to keep a receipt of payment along with the EOB and copy of the bill. If you have additional/supplemental insurance, and still owe the medical provider money, you're going to need to 'coordinate benefits'. You'll file a claim with your supplemental insurance by submitting copies of your primary insurance's EOB, a copy of the medical provider's bill, and your supplemental insurance's claim form. Once you receive the EOB from the supplemental insurance, staple it along with your original paperwork, and pay the medical provider if you still owe them money. If you have a hospital stay or emergency room visit, you're going to be bombarded with paperwork. 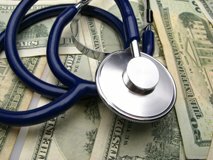 Documentation here is critical to getting help with medical bills. Simply create a separate manila folder and place any paperwork in there. Organize this folder much the same way you would any other medical bills, with the EOB(s) from your medical carriers, bills from the provider(s), and receipts of payment. As stated before, it's always best if a provider bills your insurance carrier first. If your provider does not bill your insurance, you will need to receive a detailed bill from your medical provider to submit to your insurance carrier along with your insurance carrier's claim form which they can send you, or you can download one the insurance carrier's website. Last, but not least, my favorite part… DOCUMENTATION! For instance, if I'm trying to get a claim paid through my insurance carrier, and I see that things aren't going so well, I start documenting everything on a separate sheet of paper. Who I talked to, the date, what was said, etc. This is the best way to get help with medical bills. Customer service reps are much more receptive if we're organized and polite. Since we have a big family, someone is always going to the doctor, and invariably about once to three times a month, I have to battle it out with my insurance carrier to get claims paid and taking the time to keep a separate documentation file has given me help with medical bills by getting me the most benefit from my insurance. Dates that you've talked with customer service along with, their first and last name (if possible). If they don't give you their last name, there has to be a way to document the phone call, so ask for a reference number, call number, their id number… any type of number you can use to document what was said, who said it, and when they said it. If you're just not getting sufficient help with medical bills and resolution to your problem, and you've tried talking with a supervisor or manager with your insurance carrier, it may be time to escalate and file a complaint with your State Insurance Commissioner, the Better Business Bureau, and the Department of Consumer Affairs. Here's a great link that provides information on how to do this. How to File an Insurance Complaint. I like most of you don't have a lot of time on my hands to be filing complaints, but it's important to make sure you're receiving the benefits you're paying for.